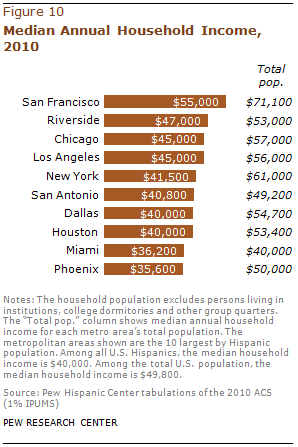 The median annual household incomes among Hispanics in the 10 largest metropolitan areas range from a low of $35,600 in Phoenix to a high of $55,000 in San Francisco. The San Francisco area also ranks highest in terms of median annual personal earnings of full-time workers ($36,000). By that metric, Hispanics in the Dallas area have the lowest personal earnings among the 10 areas ($26,000). In each of the 10 metro areas, the median annual household income for Hispanics is less than that of the general population. Similarly, the median annual household income of all U.S. Hispanics is $40,000, compared with $49,800 for the total U.S. population. The highest Hispanic median household incomes among the top 60 metropolitan areas are in the Washington metro area ($62,000) and Baltimore, Md. ($56,400)—which have the 12th and 56th largest Hispanic populations, respectively. Brownsville-Harlingen-San Benito, Texas, which is the 29th largest metropolitan area by Hispanic population, has the lowest median Hispanic household income in the top 60, at $28,600. Hispanics living in the San Antonio and Riverside metro areas have the highest rates of homeownership among the 10 largest Hispanic metropolitan areas (both 58%). Only a quarter of Hispanic household heads living in the New York area own their homes—the lowest share among the top 60 metro areas. The San Francisco and Los Angeles metro areas are the only others in the top 10 to have homeownership rates below 50%. The homeownership rate of Hispanics in each of the 10 metro areas is less than the area’s overall rate. 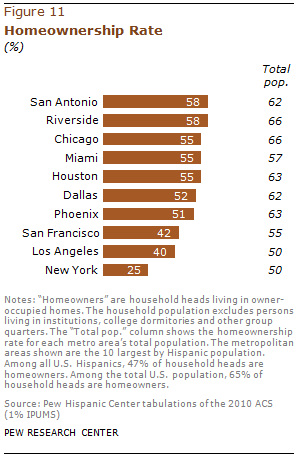 Similarly, the homeownership rate of all U.S. Hispanics (47%) is lower than that of the total U.S. population (65%). Among the top 60 metro areas, McAllen, Texas, has the highest share of homeowners among Hispanics, with 68%. As well as having the lowest household income, the Phoenix area has the highest Hispanic poverty rate (28%) among the top 10 Hispanic metropolitan areas. Additionally, one-third (34%) of Hispanic children younger than 18 in Phoenix live below the poverty line. An equal share of children in the Houston area live below the poverty line. Among these 10 metro areas, Hispanics in San Francisco have the lowest poverty rates overall (17%) and among children (23%). In nine of the 10 metro areas, the Hispanic poverty rates are higher both overall and for children than among the areas’ general populations. In the Miami area, an equal share (20%) of all Hispanic residents and all residents live below the poverty line, and the share is similar for Hispanics younger than 18 (24%) and all residents younger than 18 (25%). Among the top 60 Hispanic metro areas, Brownsville, Texas—which has the 29th largest Hispanic population—has the highest rate of poverty among both all Hispanics (40%) and Hispanic children (51%). It is the only metro area among the top 60 that has a Hispanic poverty rate of at least 40% and the only one with a Hispanic child poverty rate of more than 50%. The Washington metro area (the 12th largest Hispanic metro population) has the lowest share of poverty among both all Hispanics (12%) and Hispanics younger than age 18 (15%), followed by the 56th largest Hispanic metro population, Baltimore, which has an overall Hispanic poverty rate of 14% and a Hispanic child poverty rate of 17%. Houston has the highest share of Hispanics without health insurance among the top 10 Hispanic metropolitan areas (43%); it also has the highest share of children younger than 18 without health insurance (25%). San Francisco has the lowest rate of uninsured among the top 10 Hispanic metro areas (24%). Chicago has the lowest share of children younger than 18 without health insurance (7%). In all of the 10 metro areas, the share of Hispanics without health insurance (both total and children) is greater than that of the area’s total population. Atlanta, Ga.—the 19th largest metropolitan area by Hispanic population—is the only top 60 metro area in which a majority of Hispanics are uninsured (51%). Salt Lake City-Ogden, Utah—the 35th largest metro area—has the highest share of Hispanic children without health insurance, at 28%. The Boston, Mass.-N.H., metro area—the 27th largest Hispanic population—has the lowest share of all Hispanics (11%) and Hispanics younger than 18 (2%) without health insurance among the top 60 metro areas.